Built for both hunting and competition shooters, Bergara's B-14 Hunting and Match Rifle (HMR) supports a fully free-floated 4140 CrMo steel barrel to achieve optimal precision. The barrel also features a matte blued finish, is drilled and tapped, and has a threaded muzzle which includes a thread protector. The B-14 HMR rifle features an integrated mini-chassis molded into the stock to give the rifle repeatable bedding and accuracy. The stock also has an adjustable cheekpiece, length of pull spacers, and a QD flush cups for easy attachment and detachment of slings. Its super-smooth B-14 Action, is a two-lug system with a Sako-style extractor and a coned bolt nose and breech to ensure a smooth feeding and extraction of the cartridge. 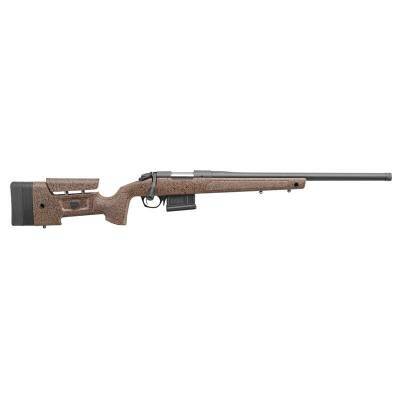 It's also outfitted with a Bergara curved trigger to guarantee a crisp, clean pull every time you fire the rifle.